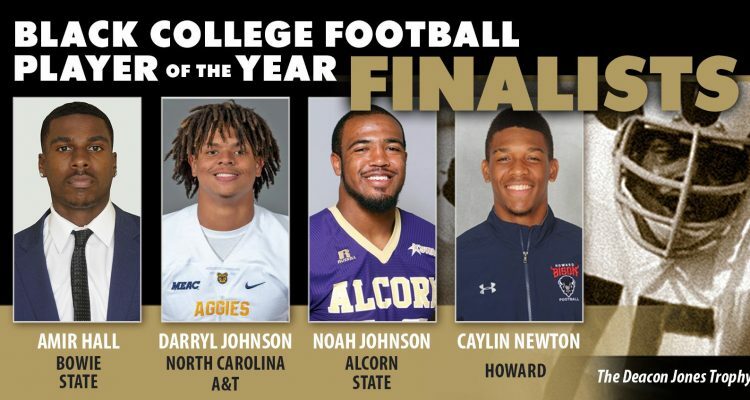 Atlanta, GA – The Black College Football Hall of Fame (BCFHOF) announced Thursday the four finalists for the Black College Football Player of the Year Award. The award is presented annually to the most outstanding football player from a historically black college & university (HBCU) that embodies the rich tradition of athletic excellence and integrity associated with HBCUs. Former North Carolina A&T State University, and current Chicago Bears running back Tarik Cohen was the inaugural recipient of the award in 2016, and Bowie State quarterback Amir Hall was selected as the recipient in 2017. The finalists were chosen by a five-member selection committee, which is composed of Black College Football Hall of Fame founders James “Shack” Harris and Doug Williams, longtime SBN broadcaster and director of news and sports for the Power News Radio Network, Ty Miller, former USA Today sports writer Roscoe Nance, and ESPN college football analyst Jay Walker. The winner of the award will be announced on February 16, 2019, at the 10th annual Black College Football Hall of Fame induction ceremony, presented by the Atlanta Falcons in Atlanta, Georgia. The winner will be presented with the Deacon Jones Trophy, named in honor of the football legend and inaugural BCFHOF inductee.